February 2017 FSN e-Newsletter - Locating Seedlings? A reminder to growers to keep your POST information up to date, especially the 'Sold Out' status for your POSTS. This can save potential customers and yourself time on the phone and remind them that you grew seedlings for their specific planting site. Growers and forest landowners POST seedlings throughout the planting season. New POSTS are immediately included in the FSN results list with last entries on top. POSTS include Forest Seedlings, Native Plants and Christmas Tree Seedlings. If you are still searching for seedlings for this season frequently check the SEARCH SEEDLINGS module on the Forest seedling Network. Just click through the selection boxes to the 'Map Search' option. Click Icon and move the point at the bottom to your planting area on the map. 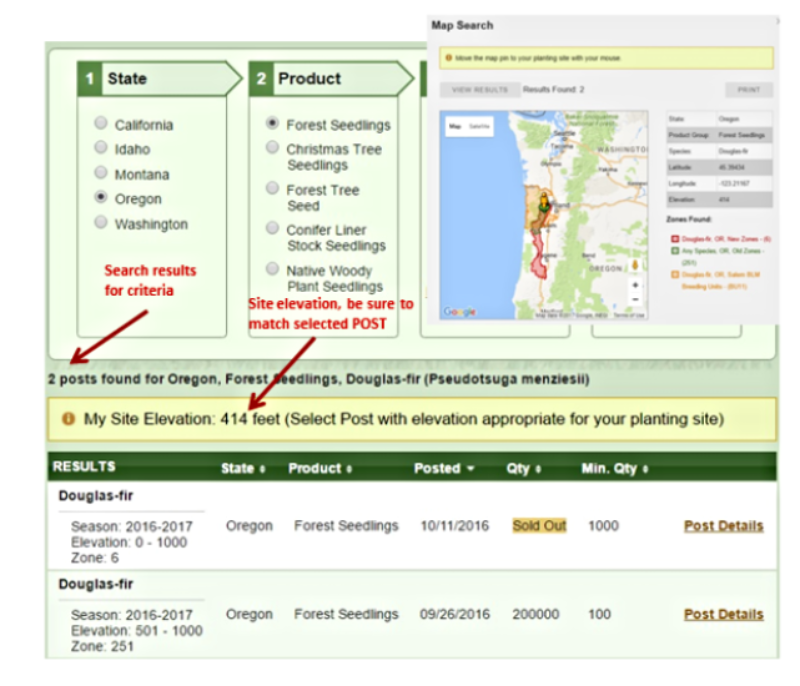 Results will identify the seed zones applicable and the elevation of your planting site. Remember to follow the 'Script Line' below the selection boxes. This is the number of POSTS available for your current filters. Seedling POSTS are below, sometimes it is necessary to scowl down to see entire list. You can review details - just click 'POST Details' on the right for additional information. You will also find the growers name and contact information so you can call for more information and/or to arrange for purchase. If you are looking for a few seedlings of different species consider checking out a small seedling sale. These events are popular with Woodland groups and Soil Conservation Districts to raise funds for their scholarship programs. Tree School events are also listed in the EVENTS section. If you want your activity on the FSN EVENT list send the Event date as soon as possible so interested people can plan ahead. Follow up with your details as soon as they are complete. A pdf of your event works well. Usually users are able sign up on-line from an Event listing that has a pdf registration form. Seedling Sales are usually held on Saturday morning or until all seedlings are sold. Linn and Lane County sales are over for 2017. Tree Schools are usually one day events that offer classes for small forestland owners on managing their forestland properties. Looking for seedlings for next planting season? Try SAPLINGS a new all-inclusive web-based business that allows small land owners to plan for their reforestation needs byordering the trees they want, when they want them. You can order now for the 2018 and 2019 seasons. Check out their website http://www.mysaplings.com. Keep in mind, order soon to allow time for the seed to be stratified for sowing. Depending on the species it can take 60 days or more. Thanks for using FSN for your seedling needs.